Deb's Cup of Tea: You. Are. No. Help. I am simply trying to get organized for the Highland Games. The weather is to be bad tomorrow so I am not going to go set up tomorrow afternoon. Plus, there's some work stuff that has me in the office organizing, something I do really well. I brought up the bins which contain the stuff I need for my table. I popped the top on the blue one and started emptying it to make sure I have everything. It was almost instantaneous. She knew exactly when I had removed just enough that she could lie down and rest her chin on the side of the bin to survey the world. I did remove her but the timer went off on my pasta so I had to get that and she jumped back in. 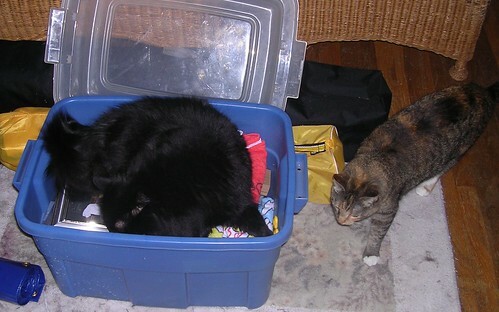 I emptied the other bin and left the top off of it but Mija is not interested. It's been over an hour and Pilchard is sound asleep in the bin. I could have sworn there's an ancient proverb that begins, "Wake not the sleeping cat..." I don't need the things in there until tomorrow. By then the novelty should have worn off.